Aliens and spaceships and monsters, oh my! Spaceships, aliens, superheroes, nightmarish creatures took over the Louisville, Kentucky, Crowne Plaza Hotel June 2-3, 2018, for the annual WonderFest USA. More than 700 entries jammed the tables in the Amazing Model Contest. Here are just a few of the more than 100 models photographed over the weekend by FSM editors Mark Savage and Aaron Skinner. 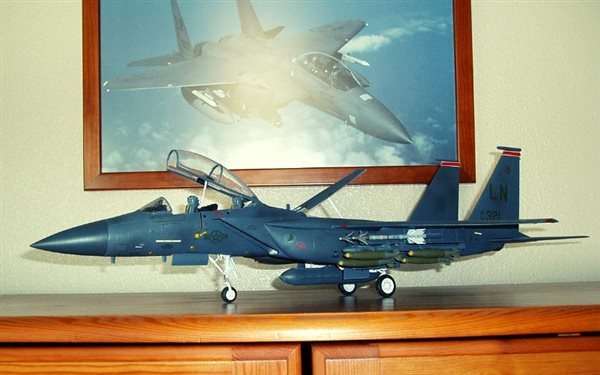 Want to meet the modelers and see more amazing builds? Check out Part 1 and Part 2 of FSM's show coverage. Look for more in the November 2018 FineScale Modeler as well as in the special issue, Great War Scale Modeling, on sale November 15. Next year’s show is scheduled for June 1-2. You can find more details, including how to enter, a timetable of events, and a list of guests at WonderFest.com. Dennis, the owner of Starcraft Models, painted the company’s 1/1400 scale Vulcan D’kyr science vessel with Testors model master enamels; many of the panels are decals. To add depth to the finish, he applied layers of red-tinted Pledge Floor Gloss. After airbrushing a base color on Geometric’s 1/6 scale warrior from Aliens, Peter hand-painted shadows and highlights with layers of Vallejo acrylics and Citadel washes. Bob built Cretaceous Creations’ 1/18 scale Pachyrhinosaurus out of the box. To paint it, he applied Tamiya acrylics over a taxidermy color, bass-belly white, with an Iwata Eclipse airbrush at 11 psi. He improved the kit base with a layer of Celluclay, silt, and small rocks, then planted bits of asparagus ferns and leather leaf for prehistoric foliage. “I build a lot of different types of models,” says Curt. 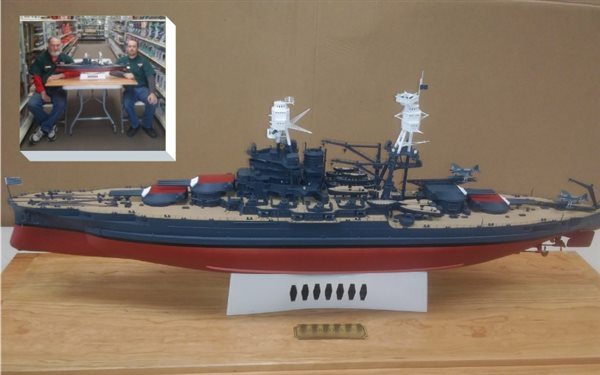 “This looked like a fun build and a way to practice my photo-etch skills.” He assembled Alliance Modelworks’ 1/144 scale steampunk submarine out of the box and finished it with metallic paints from Alclad II and Testors Model Master. Modifying Three Kings Resins’ 1/8 scale kit of Denzel Washington in The Book of Eli, Scott drilled out the holes in the sword, re-sculpted the backpack for a better fit, and added a trigger to the shotgun. He hand-painted the figure with Tamiya acrylics, and used acrylic washes and powdered pastels for shading. To reproduce the team’s U-wing transport from Rogue One: A Star Wars Story, Steve painted Bandai’s 1/144 scale model with a base of white, then pre-shaded panel lines and airbrushed another layer of white using Testors Model Master acrylics. After masking and spraying the color panels, he weathered the ship with washes and pastels. The pilot of an armored fighting suit takes a well-earned break after a battle in Jim’s 1/20 scale Maschinen Krieger diorama. He scratchbuilt the suit's interior before placing it and a Brickworks pilot on a homemade base. Tamiya acrylics and artist’s oil washes finished the model. Paying homage to Ray Harryhausen’s stop-motion movies, Rob anchored the joints of Kaiyodo’s 1/12 scale skeleton warrior with Aves Apoxie Sculpt. 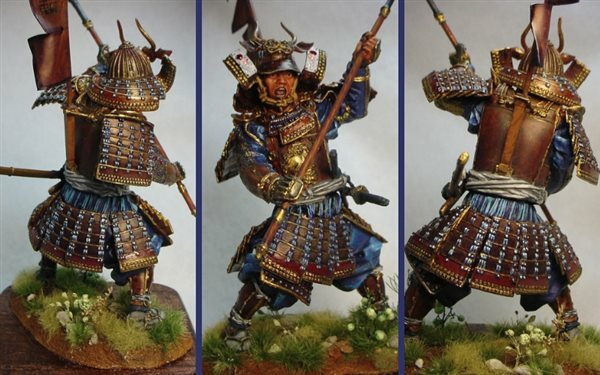 He painted the bones and armor with Testors Model Master acrylics and weathered with artist’s oils. An anti-gravity forklift charges its batteries in Scott’s scene. Don’t go looking for a kit of this futuristic hauler as Scott scratchbuilt everything using styrene and brass.